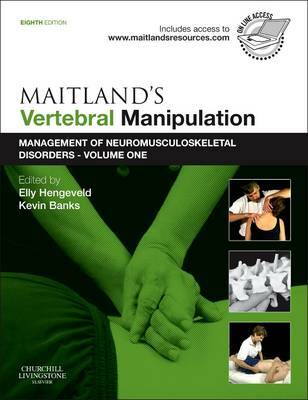 The legacy of Geoff Maitland and his seminal work, Vertebral Manipulation, continues in this eighth edition, with Elly Hengeveld and Kevin Banks leading an international team of experts who demonstrate how to manage vertebral neuromusculoskeletal disorders using the principles and practice of the Maitland Concept. Together, they ensure the heart of the Concept beats on by promoting collaborative decision-making with the patient at centre and emphasizing the art and science of observation, listening, palpation and movement skills. A key feature of the new edition focuses on a more evidence-based and analytical view of the role of mobilization and manipulation in clinical practice. The authors have written in a way that reflects their application of the Maitland Concept and how they have integrated techniques in the light of advancement in professional knowledge. Each chapter stands alone as a 'master class'. The text is systematically arranged focusing on detailed assessment, clinical reasoning and re-assessment to determine the physical dysfunction and efficacy of manipulative physiotherapy techniques, while also advocating continuous communication and interaction. Techniques of passive mobilization are also described, specifically designed around the individual patient's condition. All the chapters are written from a clinical perspective and review the evidence which informs how to deal with and manage spinal and pelvic pain as they present to the practitioner. Furthermore, each vertebral region (cervical, thoracic, lumbar, sacroiliac/pelvic) is considered from the point of view of best practice in analysing and hypothesising subjective data, examination, treatment and management of spinal pain conditions. Brand new to the eighth edition is the addition of a companion website - Maitland's Manipulation eResources - providing access to a range of valuable learning materials which include videos, MCQs, interactive case studies, research links, and bonus chapters.